Red meat in a pure form is a good source of protein and vitamin B and has been a key part of the human diet. In general, red meats are any meats that are reddish in colour when uncooked. For the most part, this consists of meat from mammals such as cows and sheep. However, the meat of some birds is considered red as well, such as duck and goose. Red meat gets its colour from myoglobin, a protein which helps the body utilize oxygen more efficiently in aerobic respiration. The higher concentration of myoglobin in red meat makes it distinguishable in colour from white meat.Red meat is a rich source of protein, saturated fat, iron, zinc and vitamin B. 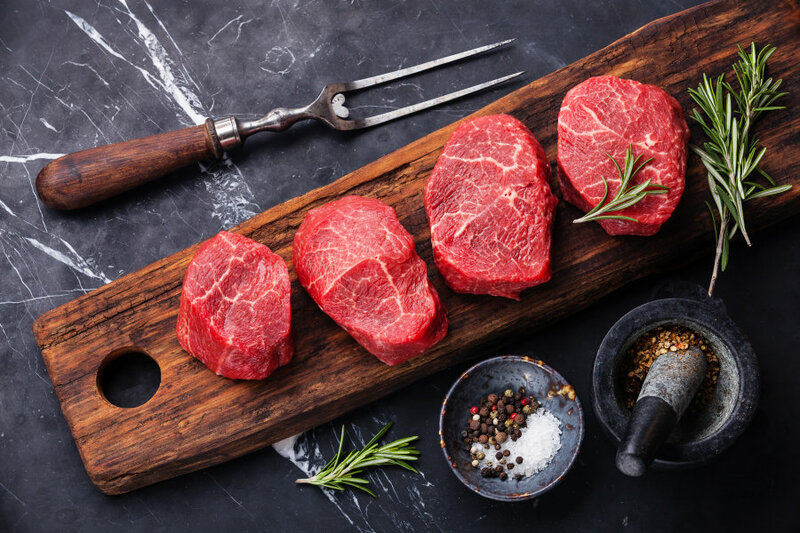 Red meat can play a beneficial role in reducing the risk of iron deficiency Anaemia .Some estimates suggest two thirds of the human population are deficient in iron.Protein is also a key player in a healthy body; muscle mass, the production of antibodies and the immune system. Unfortunately, red meat also comes with a few risks for health. (WHO) stating that eating processed meat increases your risk of getting cancer. It also mentions that unprocessed red meat is “probably carcinogenic.The World Health Organization released findings in which processed meats were categorized as Group 1 carcinogens to humans, the same ranking that is given to asbestos and cigarettes. Additionally, the WHO released findings that people who regularly eat red meat are 18 percent more likely to contract colorectal cancer.Not only does eating red meat increase your overall risk of disease in the arteries of your heart, but also causes an increased risk of certain cancers. One study from the Archives of Internal Medicine of over a half million people showed that men who ate the equivalent of a quarter-pounder hamburger a day, had a twenty-two percent higher risk of dying from cancer and a twenty-seven percent higher risk of dying of heart disease, than those men whose diet did not contain such red meat. It also showed what happened when the group who ate a large amount changed their eating lifestyle to not eat such foods. It was found that there was an eleven percent decrease in mortality in the men and a twenty-one percent decrease in women who changed to the healthy diet. People who want to continue eating red meat, there is no problem with doing so,” Stirling-Reed concludes. “It’s essential to look however at the amount you’re consuming. Opt for a few ‘meatless’ days each week, watch the portion sizes you’re having at each meal and swap some of your meat-based proteins for plant-based alternatives such as beans and pulses. The WHO does mention that how you prepare and cook meat matters. Your cooking method can determine how carcinogenic meat becomes. When you expose meat to direct flame (think barbecuing, grilling, and searing) or cooked at higher temperatures, it forms more carcinogens. This is especially true in nitrate and nitrite-cured meats like bacon. On the other hand, cooking at lower heats (think slow cooker) can mitigate cancer risk. Stick to cooking methods that keep carcinogens as low as possible.